Biddeford celebrates their class A victory at 2019 state cheerleading championship competition on Saturday at the Augusta Civic Center. 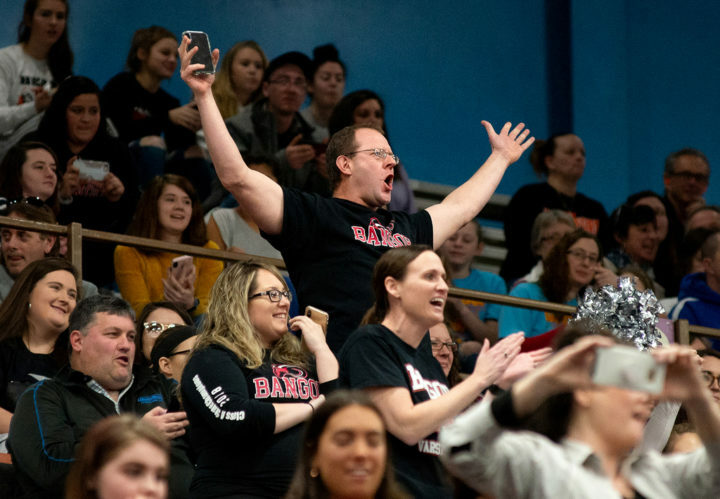 AUGUSTA, Maine — When the Bangor and Lewiston cheering squads left the mat in the center of the Augusta Civic Center late Saturday morning, there was no celebration among teammates, as is the norm after strong performances. The only team that was not aware of those emotional clues to how the Class A state championship competition was going was the lone team left to perform, but the Biddeford Tigers capitalized on the opportunity to capture their first crown since 2014. The Lewiston cheerleaders perform their routine at the Class A state championship competition Saturday morning at the Augusta Civic Center. Lewiston placed third. Biddeford finished with 92.7 points, just ahead of defending state champion Bangor (91.3) and Lewiston (89.9), which had won six titles in the past eight years. Bangor fans cheer as the Rams cheerleaders prepare to perform their routine at the Class A state championship competition Saturday morning at the Augusta Civic Center. Bangor took second place. Lewiston, Bangor and Biddeford were among the final four teams to perform, and Lewiston’s championship bid fell victim to at least one mishandled stunt as well as two tumbling slips. Bangor soon followed, and while the Rams got off to a strong start, they were not able to maintain that momentum to the finish. “My center flyer, whose one of the best flyers I’ve ever seen at Bangor, something happened in their stunt, and it went a little wrong and came down early, causing them to fall,” Bangor coach Taylor Clark said. “From there I think the energy kind of dropped, and that’s what really made it between us and Biddeford at that point. The Brewer Witches perform their routine at the class A state championship cheerleading competition on Saturday at the Augusta Civic Center. This year’s Bangor team was led by senior captains Chloe Woodward, Natasha Ivey and Alainna Roach. Others on the squad are Emily Chappelle, Rebecca Chappelle, Madison Clay, Hannah Dunn, Sydney Latlippe, Kylie Lavoie, Gracie McAuliffe, Hailey Miles, Kelsie White, Briana Tracy, Kaydence Lux, Haley Pasternack, Tynia Robinson and Hailey Tracy. Cheering for Biddeford were Brianna Adams, Mariah Bayley, Lexi Berry, Michaela Bouthillette, Brooklyn Goff, Hillary Gonzalez, Delaney Hatch, Selena Huot, Claudia Janelle, Brianna Keely, Julia Ketcham, Anna Lavigne, Mackenzee LeBlanc, Mersadies Martinez, Cassidy Mawhinney, Taylor McKay, Kairlye McQueen, Shalyn Menard, Alli Souliere, Isabella Thibault and Mercedes Thomes. The Bangor Rams cheerleaders perform their routine at the Class A state championship competition Saturday morning at the Augusta Civic Center. Bangor took second place. The Brewer cheerleaders perform their routine at the Class A state championship competition Saturday morning at the Augusta Civic Center. 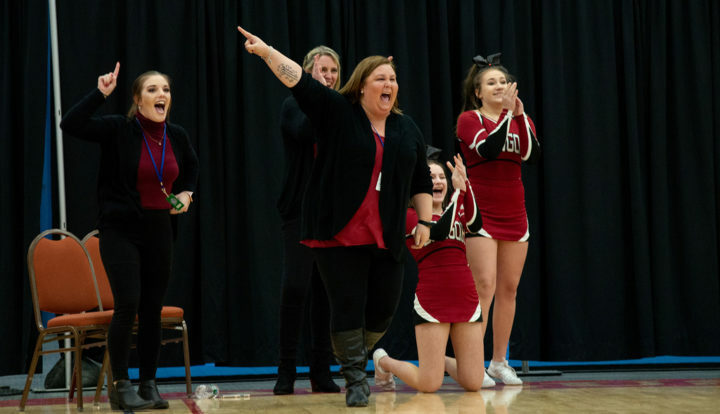 The Bangor Rams head coach coach Taylor Clark (left) and assistant coach Stephanie Crane (center) cheer on their team as they perform their routine at the Class A state championship competition Saturday morning at the Augusta Civic Center. Bangor took second place. 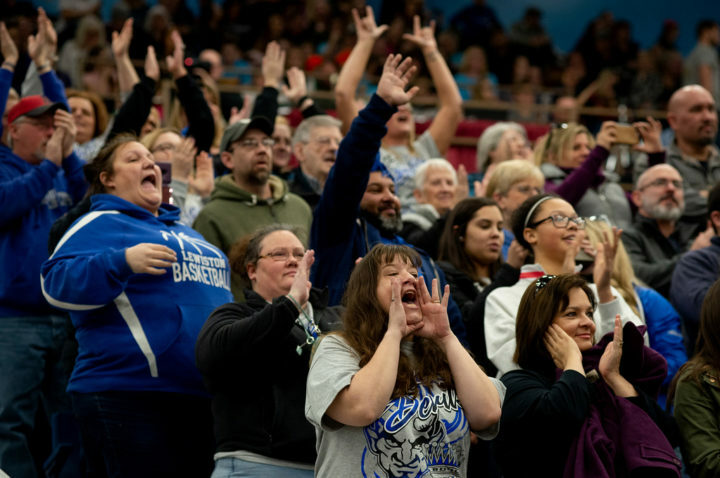 Lewiston fans cheer on their team at the class A state championship cheerleading competition on Saturday at the Augusta Civic Center. Hampden Academy performs their routine in the class A state championship cheerleading competition on Saturday at the Augusta Civic Center. Hampden Academy cheerleaders perform their routine during the class A state cheerleading championship on Saturday at the Augusta Civic Center.